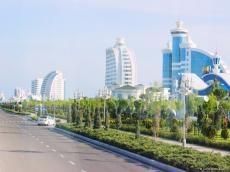 The first international conference “Heavy Caspian: Turkmenistan” is underway in the country’s tourism zone “Avaza” near the Caspian Sea, an international company Heavy World, the organizer of the event, said in a message. The structure of logistics in Turkmenistan, including the ability of the Turkmenbashi International Seaport to receive project cargoes, the state of the road and railway infrastructure and the experience in delivering project cargoes to Turkmenistan are being discussed as part of the event. More than 100 delegates from Turkmenistan, Russia, Austria, Belgium, Belarus, Georgia, Kazakhstan, Iran, Poland, Estonia, Saudi Arabia and other countries are taking part in the conference. In accordance with the program of the forum, an interactive presentation of the renewed seaport in the city of Turkmenbashi was held. “Built on the Caspian Sea coast, the new port complex is of strategic importance for the international cargo transportation system, providing access to the Black and Mediterranean seas, to the countries of Europe, the Middle East, South Asia and the Asia-Pacific region by optimal routes,” the Turkmenistan State News Agency reported. Considering the growing transit flow of vehicles through the territory of Turkmenistan to the countries of Europe and Central Asia, the well-established year-round ferry service among the ports of the Caspian Sea makes it possible to reduce the time of cargo delivery, and hence their cost, according to the report. The general sponsor of the conference is the Turkmen company “Yuk ulag merkezi”, which specializes in the transportation of non-standard (oversized) cargoes and has experience of cooperation with Baltic states, the countries of CIS, and the Persian Gulf. Meanwhile, a separate transport and logistics center (TLC) is envisaged in the new Turkmenbashi International Seaport opened in May. The TLC will consist of a warehouse complex with telecommunications and cargo processing equipment, information and technological support for the process of transportation and cargo handling. The container terminal has an average annual capacity of 400,000 TEU (twenty-foot equivalent unit). The annual throughput of this port is 17-18 million tons. Together with the previously operating port, this figure will be 25-26 million tons.